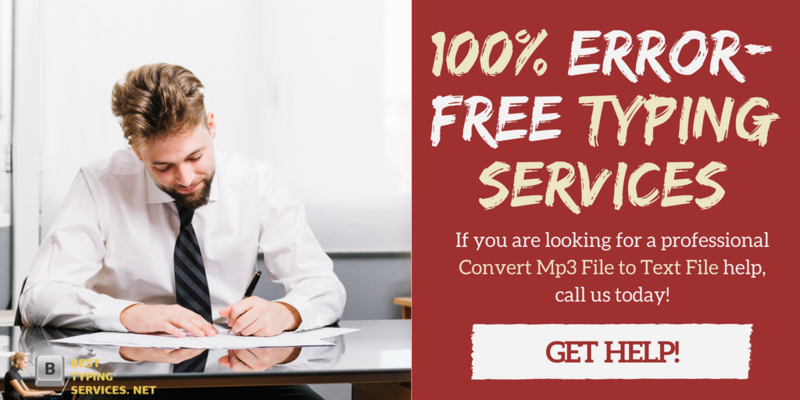 Do you need to convert Mp3 file to text but don’t know how? You are not the only one who seems to be at a loss as to how to switch all of the contents in an audio file into a word document because there are others who need to transcribe their recordings of meetings, lectures, and seminars as quickly as possible. Unfortunately, when you have to transcribe audio file to text yourself will take ages especially if you are not familiar or have some experience in this kind of work. What you need is to look for a specialist to help you out. Can You Convert MP3 File to Text? If you are worried that you won’t be able to convert your Mp3 to TXT as quickly as you want then your best bet is to look for someone who has the experience to do so. The good news is that you don’t have to search far because our transcription service can handle all kinds of audio files no matter how fast you need it. We have been in this business for years now and we know exactly how to handle transcription jobs regardless of the length of the audio file or what type of data file conversion you need. Just send them to us and we’ll take care of the rest. Transcribing files in audio format require the right equipment, fast typing skills, and a good ear. The good news is that we have all three which means you can leave your audio files with us and we’ll convert them into word documents in no time. All that you have to do is to place an order with us through our website, indicate the length of the audio file, pay the necessary fees and we’ll convert as needed. What Makes Ours the Best Among Typing Websites? There are dozens – if not hundreds – of typing websites competing for your attention and your business. A typing website can provide all manner of services that are useful to companies and professionals, from typing up letters and documents to transcribing audio and training typists how to type faster and more accurately. What, then, sets typing sites apart from each other? If you need to convert mp3 file to text just leave it with us. With our team of experts at converting audio to text, we’ll transcribe all of your audio files quickly and accurately and of course, at the best price possible. We believe we at Best Typing Services have the answer. Other typing websites claim they can help with all sorts of different services but in truth, they are often one-stop shops for simple services like data entry. Best typing services is a different kind of typing website; a typing website that is focused on providing a whole package of services to relieve the stress and workload of professionals who need extra time for their work. No longer do professionals need to worry about finding one typing site to do one thing and another typing site to do another thing. Now you can narrow all typing website down to a single typing website that does it all: Best Typing Services. What else makes best typing services special? Best typing services is a typing website that cares about the customer and is willing to offer low prices for high-quality work in order to build a relationship. Other typists for hire care about piecemeal work – one project today, one project next month. Our typing website prefers to cultivate a long term working relationship that will result in several projects taking place at once for a single company that trusts us above all other typing websites because we have earned that trust. Best Typing Services is a typing website apart, a typing website that looks at people before money because that is the best approach for a bright and prosperous future. Send your order to us and we’ll quickly convert Mp3 to word document!